Speaking to 2nd graders @ Bluffton Elementary School. When a principal at a school asks you to attend because she believes in you and your books, it’s really an honor. 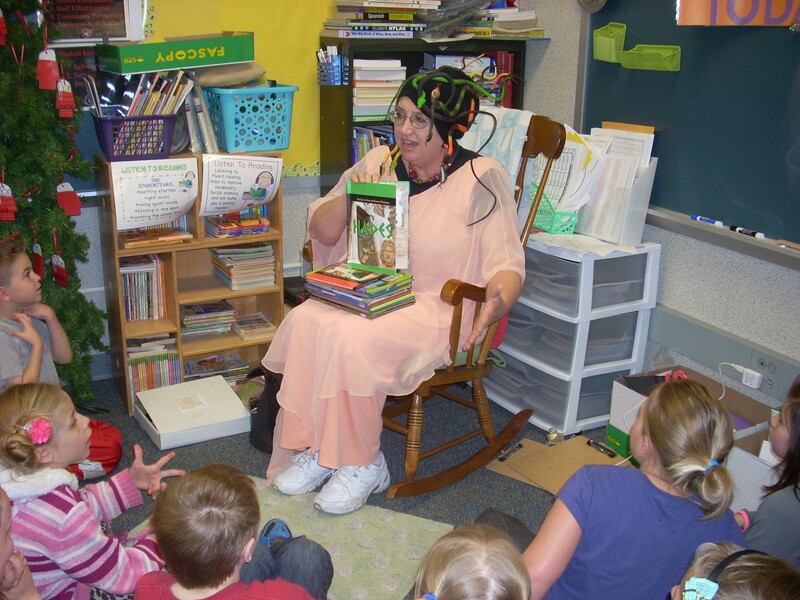 Julie Meitzler, principal of Bluffton Elementary School sent me a request earlier this year, saying that she had contacted teachers in her school with the recommendation that they invite me to visit their classrooms for an author visit. 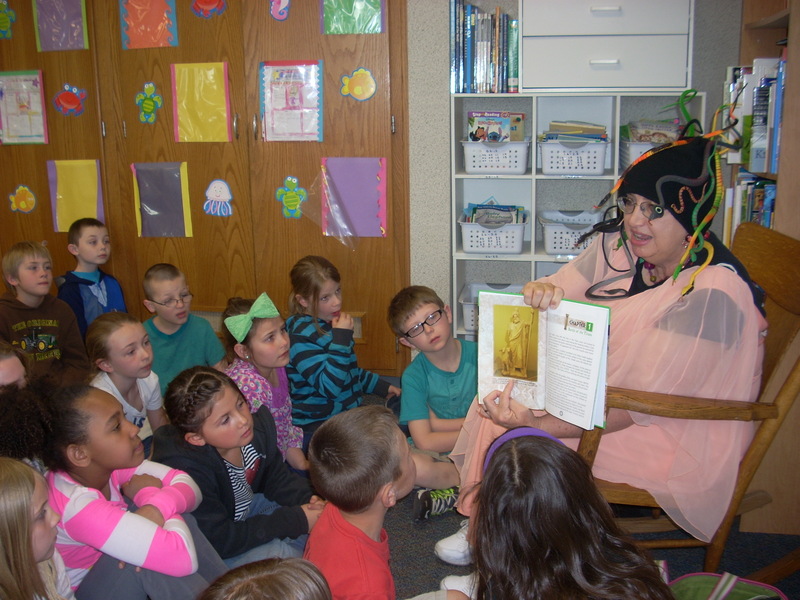 2nd graders at Bluffton Elementary School loved their visit from Medusa! 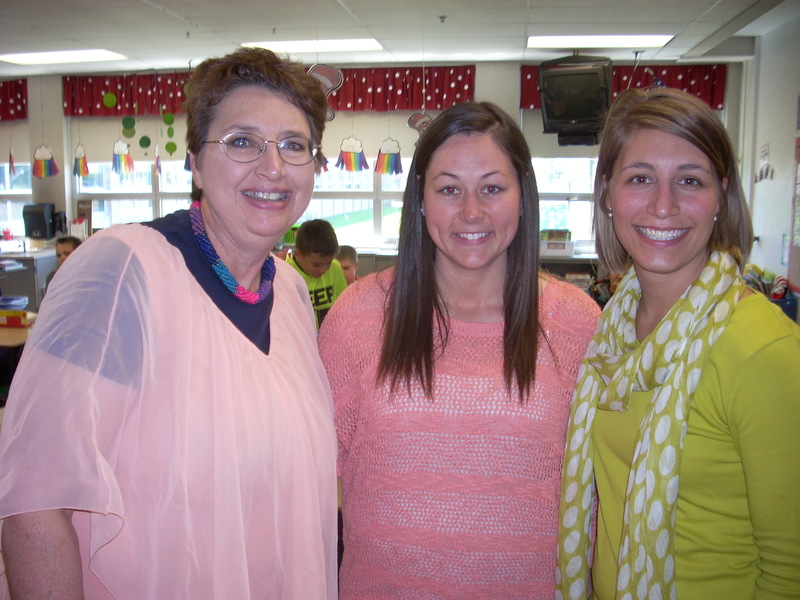 The 2nd grade teachers followed up and the result was a successful and exciting visit! The second graders at BES are great! They were good listeners as I, dressed as Medusa, introduced them to my ‘friends’ – Hades, Hephaestus, Hermes. These are of course, books that I’ve written. Keep in mind, I’m wearing a long flowing peach-colored gown and a wig of rubber snakes, very Medusa-like! I also speak in a gravelly, creepy voice as only Medusa would do. Medusa de-wigged, student teacher Stephany Derengowski, teacher Lindsay Schroeder. At one point I take off my wig (yay! It’s hot and heavy!) and then tell the students about the rest of my books. At the end we had a Question and Answer time. 2nd grade teacher Kim Bitner & me. They were attentive and the teachers were helpful and supportive. 2nd grade teacher Allison Krinn’s class sent me thank you notes that were precious! A few days later I was delighted to get a packet of thank you notes from Allison Krinn’s class. They were delightful and made it all worthwhile. If you’d like ‘Medusa’ or Kayleen Reusser to visit your class, please contact me at xxxkjreusser@adamswells.comxxx (Remove the x’s).